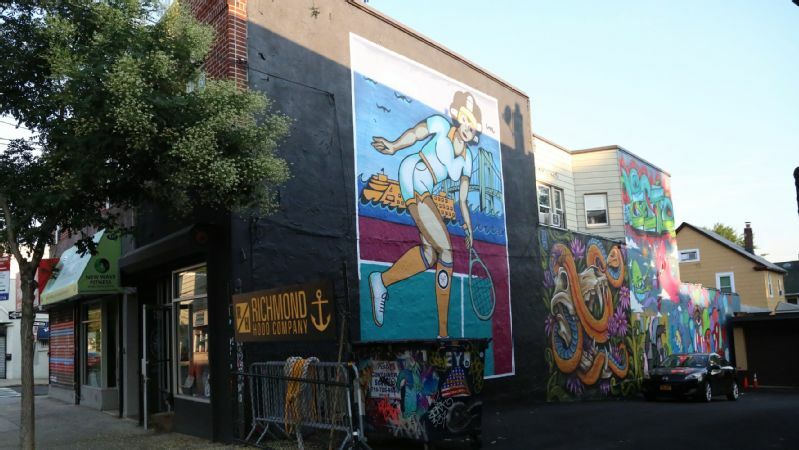 While the entire project took over two years, Jeremy Nieves needed just a month to paint the mural onto the wall of the Richmond Hood Company -- about two miles away from where the first tennis match on American soil took place. Usually in the shadow of New York City's other four boroughs, Staten Island is known for a few things: the ferry, the Wu-Tang Clan, Vinny from "Jersey Shore" and, of course, the mall. Sometimes, for residents, the shortsighted perception can get frustrating. Jeremy Nieves, who has lived on Staten Island his entire life and whose family goes back several generations in the area, is a tattoo and visual artist by day and a local history buff by night. Roughly four years ago he was reading a book on New York history, as he frequently does, and he was struck by a tidbit about his borough being the birthplace of American tennis. He had never heard of Mary Ewing Outerbridge. 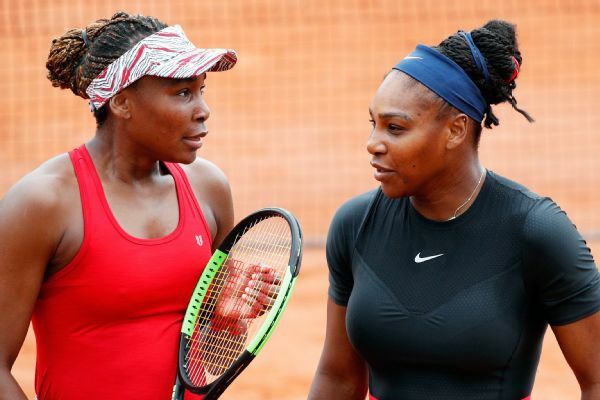 Dubbed the Mother of American tennis, she is credited with bringing the sport to the States from Bermuda by way of England. The mural in early August, with just a few finishing touches remaining. "Later that day, I took a walk down the block to what's now near the ferry terminal, but it used to be the old Cricket and Baseball Club, where the first tennis match was played. I sat down and breathed in the air, and took it in. It was amazing to think how much history took place there, and most of us who walk by it every day have no idea." Outerbridge was born in 1852 to wealthy Bermudian parents who relocated to Philadelphia before ultimately moving to Staten Island during her childhood. However, her parents made frequent trips back to the British overseas territory. It was on one such trip in 1874 when the then-22-year-old spotted British army officers playing tennis. It was love at first sight. After playing on the lawn of a family member's house, she was determined to bring the game back to the United States. She returned to New York, by ship, carrying rackets, balls and a tennis net -- all of which raised some red flags with customs officials. The items were confiscated but ultimately retrieved thanks to some explaining by her brother who worked in the shipping industry. Inspired by her story and surprised by the general lack of awareness of it, Nieves wanted to find a way to honor Outerbridge's contributions and make sure the people of Staten Island knew who she was and what she had done for the sport and borough. When Nieves' friend Tariq Zaid came to him in 2016 in hopes of collaborating on a project that would incorporate his art and local history, he knew exactly what he wanted to do. Zaid, who is a co-owner (along with rapper Redman and Mike Alvarez) of Richmond Hood Company, a Staten Island streetwear brand, immediately loved the idea. The crew agreed to create a T-shirt featuring Outerbridge's likeness. "The whole business model of the shop is to kind of represent Staten Island in a cool way with fresh and fashionable pieces," said Zaid. 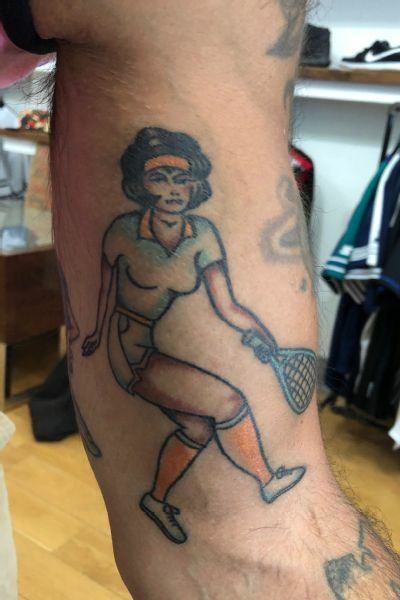 "So when we discovered that about our tennis history, we felt it was T-shirt worthy, and knew people who appreciate Staten Island subculture and those who appreciate tennis would love it. "[Outerbridge's] story spoke to me. Her being a woman who was intrigued by something foreign, something new, and who wasn't afraid to say, 'Hey, I'm going to take some nets and some rackets and some tennis balls, and I'm going to bring this back home,' that just resonated with me," said Zaid. "It's like, 'Go Mary, rock out.' 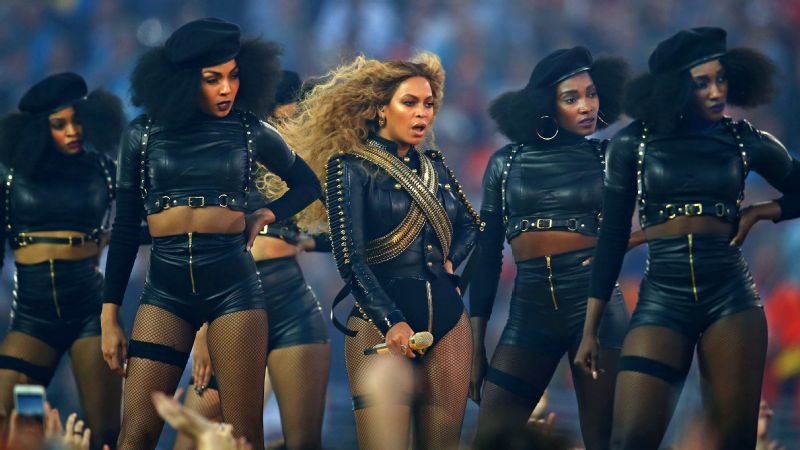 I think that attitude is just as important today as it was then." Tariq Zaid commemorated the project by having Jeremy Nieves tattoo Mary Ewing Outerbridge's image in his arm. The shirt was released in 2016 and had a successful one-year run. When Zaid was trying to figure out mural ideas for 2018, he went back to Nieves and asked if he would be interested in taking Outerbridge to a bigger canvas -- a canvas that spanned the side of a three-story-high building, or about 1,500 square feet. With the help of a few other artists and grants from the New York Department of Cultural Affairs and Staten Island Arts, Nieves got to work on the outside wall of Richmond Hood Company. More than two years after their first discussions about the project and having used more gallons of paint then they can count, they will officially unveil the finished mural, called "Le Royale Tennis," this weekend, ahead of the US Open in nearby Queens. 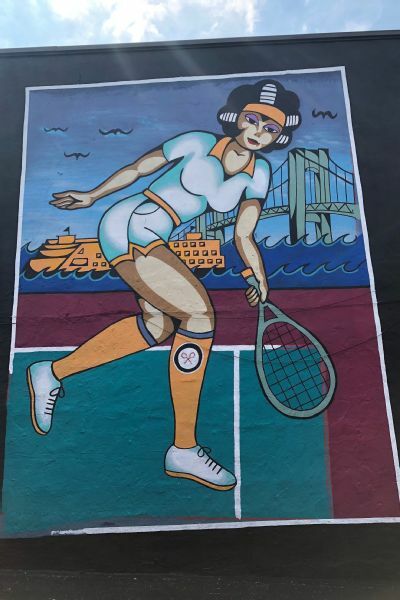 In hopes of giving it a more modern feel, and attracting the interest of Staten Island's younger residents, Nieves designed Outerbridge in almost a pinup fashion, with a 1970s tennis feel. The colors are bright and vibrant, and the ferry and bridge are prominently in view behind her. Nieves and Zaid have already heard positive feedback from those who have seen it, including from some who typically aren't fans of street art, and hope it can be a source of pride and inspiration for all who see it. "I hope when people walk by and see the mural, it sparks the same thing that happened to me, and gets them interested in the history of this place," said Nieves. "Maybe it can give some hometown pride and help prove there's so much to be proud of living here. And the more of a personal connection you have to great historical figures, the more realistic your ambitions become. It's like, 'Well, this person was from Staten Island and look at what she accomplished, so maybe my dreams aren't so far-fetched after all.'"